This is another great recipe from Delicious magazine, with a few slight changes and variations. A perfect mid-week dinner, with some leftovers for sandwiches. The original recipe uses 2 Tbs of Ras el Hanout – a Moroccan spice blend available in some specialist shops. But it’s not difficult to make, so I have explained how to do this. Don’t worry if you’re missing one of the spices, just add something else. In the salad the original recipe uses freekeh – an ancient, but now new and trendy grain. I used pearl barley instead. 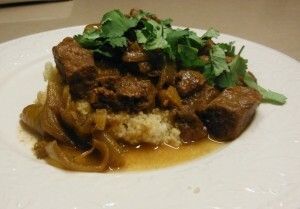 You could also substitute burghul (cracked wheat) or couscous. The second time I made this dish I served the chicken and onions on mashed sweet potato instead of the grain salad, which was also very tasty. Costco sells two small punnets of fresh pomegranate seeds for about $10. Freeze them in ice cube trays, then you can whip a couple out to garnish dishes like this and add a splash of colour. Pre-heat oven to 180°C. Rinse and pat chicken dry with paper towels. Mix Ras el Hanout with the salt, pepper and the 2 Tbs oil and brush all over the chicken, both sides and inside. Place onion slices in a roasting pan and sit chicken on top. Roast for between an hour and a quarter and an hour and a half, or until juices run clear when thickest part of chicken thigh is pierced with a skewer. After about 40 mins of cooking, turn chicken over and about 20 mins before it’s ready, turn it back over again. When you turn the chicken, move the onions around a bit so they don’t burn. Add about ¼ cup of water if they’re starting to burn and stick. Meanwhile cook barley in boiling salted water for about 30 mins or until al dente. When almost cooked add the drained lentils. When barley is cooked drain both and place in a bowl. Add remaining ingredients. Mix dressing ingredients and mix with grains. When chicken is cooked brush all over with Pomegranate Molasses then cover loosely with foil, turn off the oven and leave it in there for 10-20 mins or until you are ready to serve. The chicken will continue to cook, resulting in meat that is almost falling off the bone, but we liked it that way. 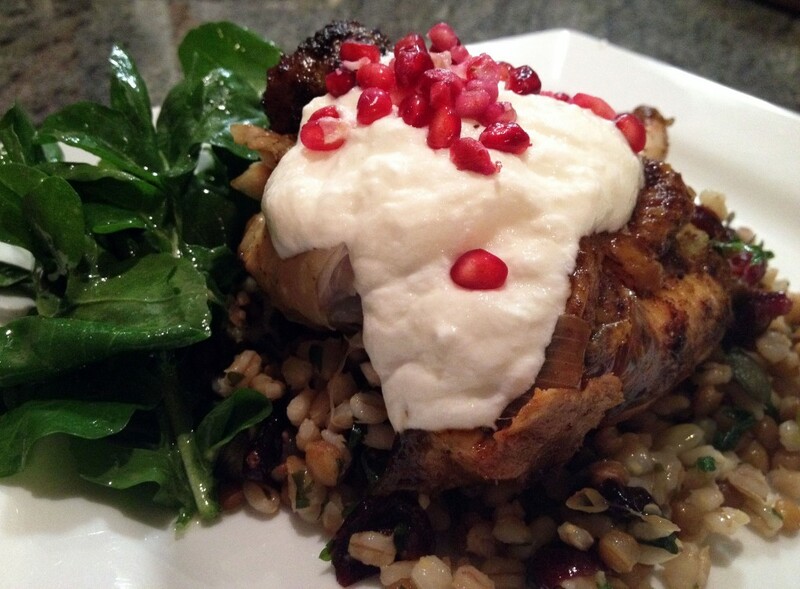 Carve chicken into portions and serve with some of the onions on a bed of grain salad. Top with a dollop of yoghurt and some pomegranate seeds and serve a rocket salad, dressed simply with a little olive oil and lemon juice, on the side. Ras al Hanout: An Australian tablespoon = 20 mls and a teaspoon = 5 mls. So to make 2 Tbs of spice mix you need 8 tsp of ground spices. 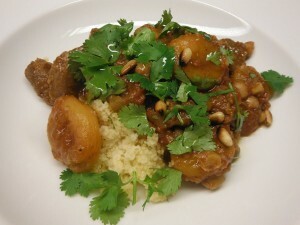 Mix together 1 tsp of each of the following: cumin, coriander, paprika, ginger, cardamom or fenugreek and turmeric. Then add ½ tsp each of cloves and nutmeg. And ½ to 1 tsp chilli powder, to taste. For kids you may prefer to leave the chilli out altogether. Pomegranate Molasses: a sweet and sour sauce from Morocco available in some specialist shops. If you don’t have any either leave it out, or substitute 1 Tbs Thai Sweet Chilli sauce or honey mixed with 1 Tbs balsamic vinegar. Variations: instead of serving chicken on grain salad, serve it on mashed sweet potato or pumpkin (add butter, S and P). 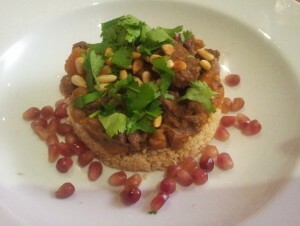 We’re very fond of Moroccan flavours so this recipe caught my eye when it appeared in the latest Delicious magazine. It comes from Mojo, Luke Mangan’s new wine bar in Danks Street in Sydney, which serves “sharing plates” to go with the wine. 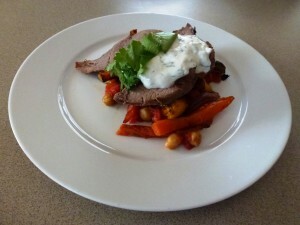 Serve it on its own or with grilled lamb cutlets or my Moroccan lamb. As we’re in the middle of winter I served it slightly warm and it was fantastic – definitely a keeper. Preheat oven to 200ºC. Trim cauliflower removing green leaves and stem. Slice cauliflower into 1cm slices from top to bottom – some will fall off as florets. Place in a roasting pan with chickpeas, oil and spices. Toss with your fingers to coat everything thoroughly. Bake 20-25 mins or until tender and golden. Cool a bit then mix with the herbs. Meanwhile heat port in a pan or microwave. Add currants and leave to soak for 10 mins or until plump, then drain. The recipe says to discard the port, but why not drink it? Heat wine in a pan or microwave, add saffron and stand 15 mins, then strain into a bowl, discarding saffron. Add yogurt, mustard and lemon juice to taste and mix well. Divide yoghurt dressing between 4-6 serving plates in a puddle in the middle. 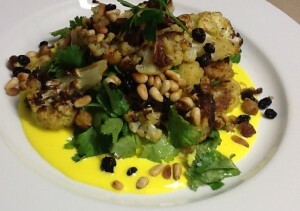 Top with cauliflower mixture, garnish with currants and pine nuts and drizzle with extra oil. Alternatively serve in one large serving bowl, drizzled with the dressing. Grind the whole spices and salt to a powder in a spice mill or mortar and pestle. Add the powdered spices and mix well. Keep in a jar with a lid. Best used within a couple of months.